Growing up, we didn’t eat garlic noodles, but have enjoyed it since living in California from the famous Crustacean restaurants in Los Angeles and San Francisco who claims it as their signature dish. Buttery and garlicky, this dish has everything going for it by it’s sheer simplicity highlighting two very powerful and addictive ingredients. Their garlic noodle recipe is a closely guarded secret by the restaurant which makes a big deal out of a “secret kitchen,” a kitchen within a kitchen where only family members can go into. This arguably is all well and good from a business point of view, but we’re all about sharing easy recipes that everyone can enjoy. So this is our rendition of garlic noodles. 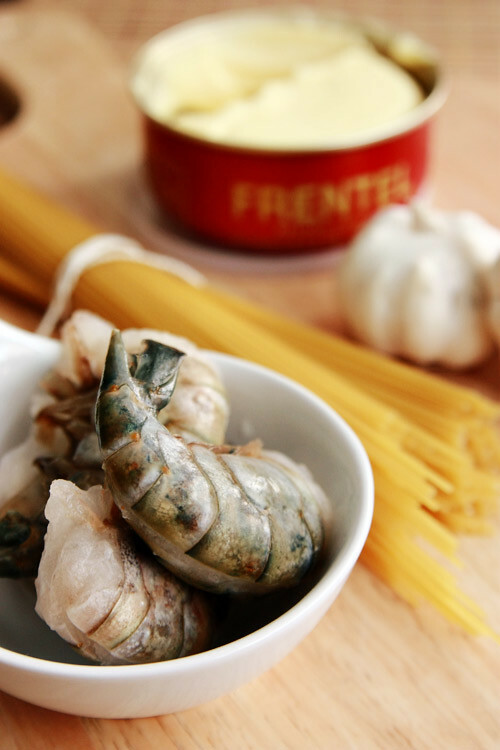 A dish of simple flavors must rely on high quality ingredients–fresh and abundant garlic and high quality butter. We use Frental beurre demi sel, a French salted butter that is wonderful and noticeably more fragrant than your average stick of butter. We use plenty of fresh garlic, finely minced, saving even any juices we collect. 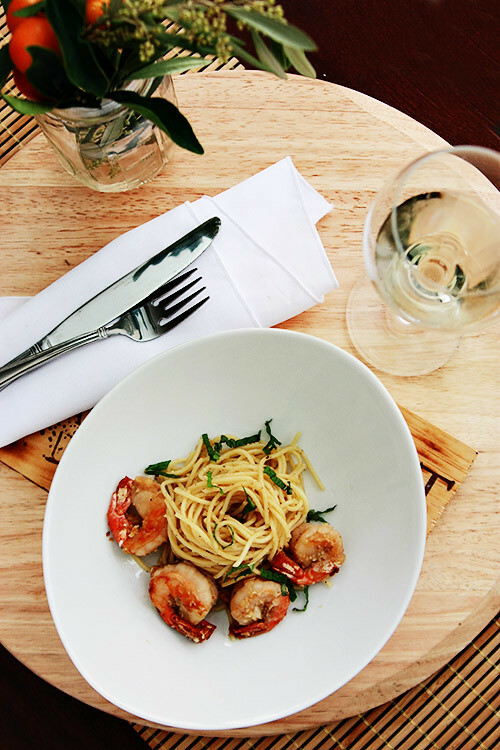 We like the simplicity of using thin spaghetti noodles and finally, we love this dish with large plump prawns and topped with fresh herbs to finish. Boil the thin spaghetti noodles al dente according to instructions. Drain and set aside. In the meantime marinade shrimp with oyster sauce, salt, pepper, sugar, and 1 tbs of the minced garlic for about 15 minutes. In wok with medium high heat, add 1 tbs butter and 1 tbs garlic. Quickly stir fry the prawns just barely opaque and half way done, about 2-3 minutes. Remove prawns, any juices, and garlic from wok and set aside. Add 2 tbs butter and additional 1 tbs garlic to the hot wok. Add the noodles and quickly stir fry, tossing noodles to even coat with butter and garlic, about 2 minutes. Return the prawns to the stir fry and cook another 2-3 minutes. Add the green onions, season to taste and transfer to serving platter. Grate fresh parmesan cheese and enjoy. Cooks note: Use more or less garlic according to taste--be careful not to let garlic burn. If you can't find French beurre demi sel, use the best quality butter you can find. Unsalted butter can be used, just adjust seasoning accordingly. Use egg noodles if you prefer, but we like the consistency of good thin spaghetti noodles. A few months ago we happened to receive an eco-friendly ManPans 12″ stir fry wok and steamer set for review and thought this would be the perfect dish to use it on. From the exterior construction, the wok looks quite heavy—yet, that’s the most deceiving and remarkable part about this wok—it’s extraordinary light. This is really important because we’re always shaking and tossing food around rather then using a spatula. Plus, the handle is so cool..literally! 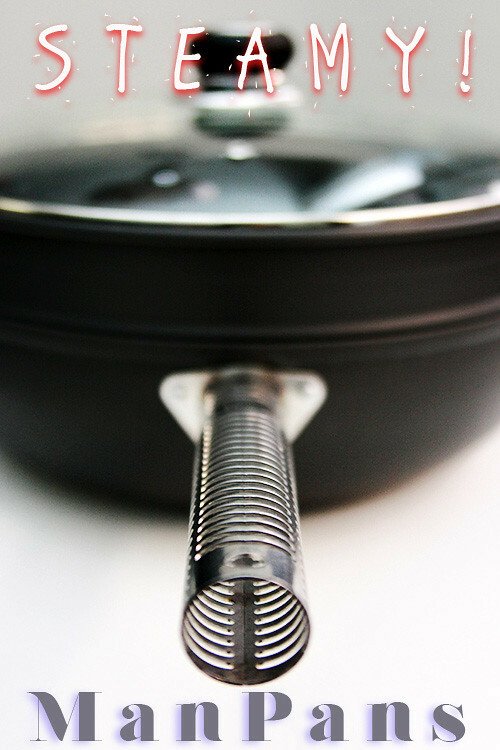 A second distinguishing thing we noticed when “wokking” with the Manpans was that food seems to cook much faster compared with our other pans at the same tempurature setting—a testament to it’s ability to transfer heat efficiently. In fact, the first time we used it, we nearly burnt a dish because we weren’t used to how fast and hot it heated up. This quality is quite ideal as you want wok at high temperatures for short periods of time to seal in flavor and juiciness. Another great feature is the steamer attachment. It’s so much easier than to lug out our 3 tiered steamer. Great for steaming vegetables, dumplings, and even banh chuoi hap, a banana pudding on the fly. The holes in the steamer are small enough that you can even steam xoi~sticky rice in it without using any cheese cloth or muslin. We’re sad we no longer have our ManPans stir fry wok and steamer, but we’re glad it’s in the very capable hands of Hong’s mom. However, we are happy to announce that in celebration of our 2 year blogversary ManPans will be giving one stir fry wok steam ($160 dollar value) to a lucky reader! Leave a comment stating what meal you would cook for your mother in law (whether you love her or can’t stand her and even you don’t have one, just pretend) utilizing the the ManPans stir fry wok and steamer (we apologize, but only USA addresses only). Chosen by random.org, the winner is Alexandria B. Congrats! Contest ends in midnight pacific time Friday May 6th. The winner will be chosen randomly. Be sure you enter a valid email address, because if your name is drawn and we can’t get a hold of you within 48 hours, we will choose an alternate winner. Prize will be shipped to the winner directly from ManPans (to either you, or the recipient of your choice). 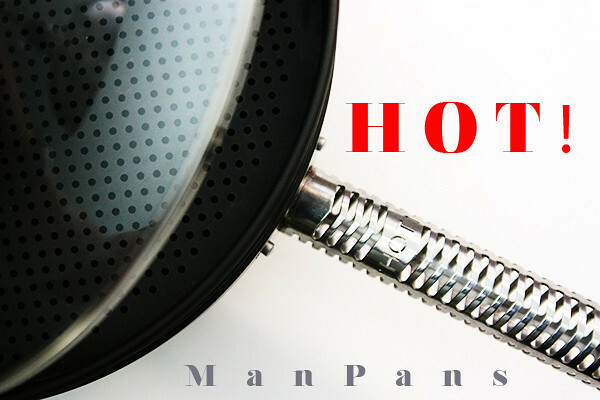 Find out more about Manpans and their complete set of eco-friendly cookware on their site. Luckily, I love my Irish mother-in-law and would cook a steamed whole Red Snapper and possibly some dumplings too in the wok. Happy 2nd Blogversary! i would love to make dan dan mian for my mother-in-law! Of course I follow you on FB! Andrea C.
I just “liked” ManPans on FB. Andrea C.
i would love to make dumplings for my (future) mother-in-law – mainly because i don’t think she has ever had any! My mother-in-law is hispanic..but I would cook her stir fry udon noodles! I’ve been wanting to try to figure out this recipe for while… if only because I wanted to know why my brother in law would pay so much for noodles we could make at home! Anyway, for my entry for the pans, I’d probably cook mi xao don with the pans. It’s one of my favorite things to eat, and my mother in law likes it too! Then I’d use the steamer to make banh it (the sweet kind, with coconut). now that sounds like a great meal for the whole family! we’re not saying ours is better or anything but yes, they do charge an arm and a leg! lol! yes, Vietnamese mothers can be critical.. I would make beef with basil. I love Thai basil. I would make steam scallion ginger fish with the steamer. Yum! I would cook, Dungeness Crab!!! With salt garlic a lot of green onions! and steam some fish and green beans if I had two! I would make seared spicy crispy shrimp and I would steam pork buns! My girl friend’s mom or mother-in law to be is Vietnamese. I would try to mimic her steam bass fish with ginger and garlic soy sauce topped with green onions. In the wok, I would try to make pan seared scallops with garlic and thyme…YUM!. Vietnamese and American dish meal with side veggies to round up the dinner. Hope I win! we just move to NYC in need of appliances!. spicy shrimp and chinese spinach with garlic. I would like to cook curry duck but not too curry. So yummy! I don’t think she ever had curry duck. <3 you two. I forgot to mention how good the garlic noodles with prawns looked! I’ve always wanted to try garlic noodles. If I win the manpan, most definitely give it to my mom. I know she will love it. I would probably have to make garlic noodles for my mother-in-law. I’ve been trying to turn my in-laws onto the wonders of garlic forever to no avail, this might be the dish to do it! walnut shrimp bc its my favorite and at least i would eat it. haha. SInce imitation is pure flattery, I would make Garlic Noodles with Prawns (which she loves) and I would steam some gai lan too. These pans are so cool. My mother-in-law bought us a wok (not a good one) and the coating peeled off after two uses. This would be a great upgrade!!! Thanks so much! Hmmm, black bean/garlic or ginger/scallion crab. YUM! 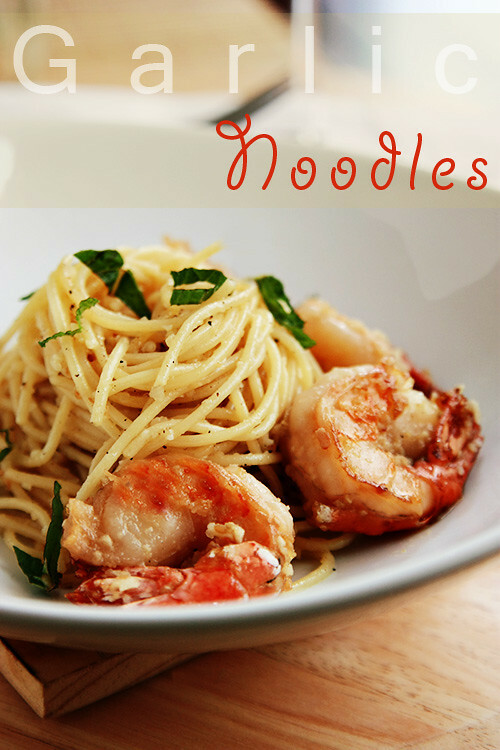 I would love to try your garlic noodles & prawn recipe, it looks fantastic! i’d make my mother’s recipe for “chicken” with mustard greens my mother in law loves my mom’s cooking! I would make my future MIL sake steamed live tilapia with ginger and scallion oil. We love fish! I would cook up some Pineapple Beef, it is one of my wife’s favorites and I think my Mom in Law would like it as well. I have like Manpans on Facebook — Jeff S.
I have liked The Ravenous Couple on Facebook — Jeff S.
That is one scrummy dish! Shrimps pair so well with garlic. in the wok, i would fry up some chinese donuts and in the steamer, i would make some xui mai. This wok looks like a great idea! I especially like the steamer insert! Thanks! For my mother-in-law – steamed fish or stir fry fish. 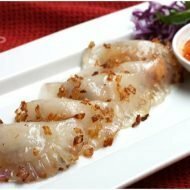 Every time we go out to eat (and it’s usually at a Chinese restaurant – each person has their favorite requests – her’s is fish…. and garlic green beans. Yum. I would love to make sesame-crusted tuna with teriyaki stir fry! Mike H.
For my “mother in law” I would stir fry prawns the way my dad did, with the shell on, a somewhat sweet tasting soy sauce and ginger. I’ve only met my mother-in-law twice in 25 years so I might make spiny lobster with bitter melon if she ever comes to visit my partner and me 😉 Would love to have this WOK. Ours is heavy as an anchor and takes much upper body strength to shake and toss properly. i like the ravenous couple on fb! I follow Man Pans & The Ravenous Couple & tweeted the giveaway! I would love to make taiwanese 3-cup chicken with steamed veggies! Oh… and I’m subscribed to your blog! I would make hot and spicy garlic shrimp. And a facebook fan of Ravenous Couple! I “liked” Manpans on FB! I would make my her my mom’s special meat stuffed eel for an eel adaption of goi cuon. YUMMO!!! I would make the garlic noodles for my mother-in-law! We just had the garlic noodles at Thanh Long (original Crustacean restaurant) for her birthday and it was yummy! my mother-in-law is an Indian and she’s pure vegetarian. She likes it when i stir fry vegies with soy sauce and vermmicelli. I am a FB fan and now follow you on Twitter. I have had the garlic noodles at Crustacean many, many times. I always felt there was some sweetener added to them. So glad you posted your version; probably even better than Crustacean! By the way, I liked ManPans on FB and Twitter as well. I would make my MIL some gyoza and steamed vegetables if I had my own ManPan. great giveawa and congrats on 2 yrs! I have a step-mother in law. Though she was not the best step-mother to my husband, she has proved to be a good grandmother to my daughter. I’m a little intimiated to cook for her since she’s an awesome cook. Perhaps, I will cook this garlic noodles. I would make chawanmushi in the steamer! My MIL has sadly passes, but she always loved fish. In her honor, I’d steam a white fish with ginger, scallions, soy & sesame oil. I would make kimchi fried rice with SPAM and fried egg. Also “like” you on FB. I’d fry up some dumplings! I would make banh beo with the steamer and try out your garlic noodle recipe with the wok. Thanks, My MIL is a great cook she has taught me many dishes over the years and so greatful she did. In return I have cook for her! So if I were to win I would be making Banh It or Banh Beo or the garlic noodle. I would make my mother-in-law shrimp in garlic butter. Sesame Chicken, mmm!!! Thanks for a great opportunity! Shrimp stir fry with ginger, garlic, scallions, snow peas, etc. Chicken with ginger, soy sauce, lemon juice, red pepper, and onions. Spicy Shrimp with Mango…I made it for her a few weeks ago and she loved it! I would make my MIL barbacoa! Load it with vegetables, herbs, spices, stock and bring that to a boil on the stove; then find a grate that will fit the top rim and place seasoned beef cheeks on top and stick it in the oven for a six-pack’s worth of time. Shred and find some corn tortillas! I know that I would like the garlic noodles, mother in law, probably not so sweet and sour chicken, that she would love! I would make my mother-in-law some jap chae or steamed fish in a soy garlic sauce. I would cook fried rice for my MIL. I would cook a vegetable stir fry with tofu since my MIL is vegetarian. I would serve it with soba noodles since my FIL loves noodles. My future mother-in-law has is into healthy eating, so I’d whip up a shrimp and snow pea stir fry with perhaps a batch of coconut rice on the side. I make a pretty good Okra dish indian style and would make that for my mom-in-law and with the steamer i would make south indian rice cakes which i know my mom- in-law loves! I will definitely try to make this garlic noodles for my MIL. She would love it! I would make pad thai with shrimp since she loves thai food!! If I were to make a meal for my MIL, I would make stir-fried beef and broccoli for her. My MIL is no longer with us but I would try to make her favorite shrimp with lobster sauce with this pan. I don’t have a wok, but an old boyfriend cooked basically everything in his, so it must be very handy. I’d probably start out slow with a spring veggie stir fry. I’m now subscribed to you via Google Reader. I’d make some fried rice. I love it at restaurants and definitely want to find a way to replicate it at home. I am definitely going to try this recipe. Love your blog! I just subscribed to your it and hope I will win a ManPans! I’d make a chicken curry, because that’s what my MIL likes best out of my repertoire. 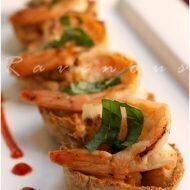 Walnut Shrimp – her favorite! I would make com bo luc lac for my mother in law! She loves that dish at all the restaurants, so she would want me to make this for her! I did all the requirements! Liked your FB page and Manpans as well! Haha, I want this one. those handles *are* pretty cool. My MiL like steamed fish so I would make that with the steamer attachment. Have not seen my MIL in years but I would whip up some chow mein. If it was my own mother I would try making steamed pork buns. My mother-in-law died several years ago, but I would use the Man Pan wok to make her some incredible garlic-ginger crab based on a dish we ate in Guilin last year. I don’t want to kill my MIL with my cooking but I would make Thai stir fry chicken with green beans and chilies. I’d make gyoza! I’m convinced that gyoza, mandu, etc. are the perfect nosh for any type of company. It’s my favorite, will definitely make it this weekend! Thanks for sharing! i would make sesame chicken. nom nom nom! Noodles, butter and garlic. Enough said… I’m in love with this recipe! I am going to make her “bun rieu”. She loves my bun rieu and even admitted I make that course better than her. I guess it must really good because she hates my cooking. Since my mother-in-law is Italian, I’d make a noodle dish in the manpan – perhaps a spicy pan-fried amatriciana. I love manpans wok, I subscribed to your blog, liked Ravenous Couple and Manpans on face book and tweeted …. JOE F.
I’d make Banh Khoai Mi for her. Would love to try the wok as a steamer for the mung beans. I also subscribed to your blog – added to my iGoogle homepage, yay! For my future mother in law I’d make Caramelized Shrimp Pork Belly with stir fried green beans. I think it’d really impress her! I followed both you all and ManPans on Twitter and RT’d from verybecoming. I’d love this wok steamer to make MIL lemongrass chicken with peanuts and curry, then xoi with mung beans!! For my future mother-in-law, I would like to recreate my dad’s ginger steam fish. It was always full of flavor and down right delicious. I liked The Ravenous Couple on Facebook. I would make some sort of fried chicken — most likely sesame or sweet and sour. I don’t have a mother-in-law yet, but hopefully will one day! I am a follower of both ManPans and you guys on Twitter and tweeted about the exciting giveaway! I would cook my mother in law Tom Rang Thit Ba Chi Caramelized Shrimp Pork Belly with the wok, and use the steamer to cook rice. i would make steamed fish over soft tofu with garlic, dates, shitake, woodear, scallions and cilantro. served with rice. wow, that’s pretty cool. pick meee, please!! I’m subscribed via Google Reader. Thanks. I would use the ManPan steamer to make my MIL xoi vo, and cook her favorite VN dish, cha gio! I would make stir-fried lemongrass chicken for the Mother-in-Law. Also, I performed all that was required of the bonus entries. I ‘d to use Manpan to make PadThai, and wonton. 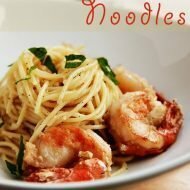 Love your garlic prawns and noodles recipe, sound delicious! Don’t need a pan, but if i win, i’d gift it to you for your wedding present. I love my mother-in-law and she would eat anything I make for her, but her favorites have been the left over sauces from our braised lamb shanks or the chianti braised shortribs. I would cook my mother in law a full meal with some bo luc lac and some stir fry veggies. Do you peel the shrimp before of after you wok toss them in this recipe? Thanks! Delicious! This will definitely be on a rotation. Thanks. My chinese work is shipping this week. 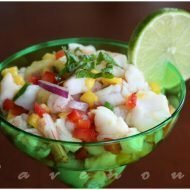 I’d love to try this great recipe of yours!!! Can’t wait. Thanks, Jen. This became very simple to produce and my bf adored it- oxoxo! He loved it so much, he said they wouldnt mind possessing this dish once a week -LoL. The shrimp were being very flavorful, and overall simply delish.